Yes, this is a myth!! There are plenty of root beer brands that are gluten-free. Every time I see someone say they avoid all root beer because it contains gluten I cringe a little. I took the liberty of researching different brands of root beer to find out whether or not they contain gluten. 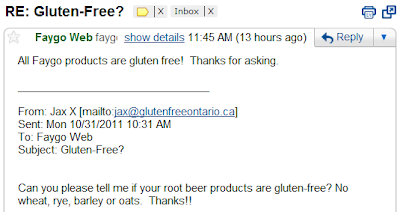 I searched each website for information on whether the root beers were gluten-free and if no information could be found, I emailed to ask the company. Here are the results of my study in alphabetical order. 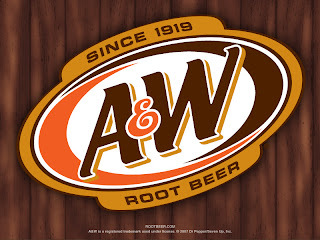 A&W Root Beer - GLUTEN-FREE! Turns out, the lady who responded to my email at A&W has a son who was just diagnosed with Celiac Disease and lives in Ontario! 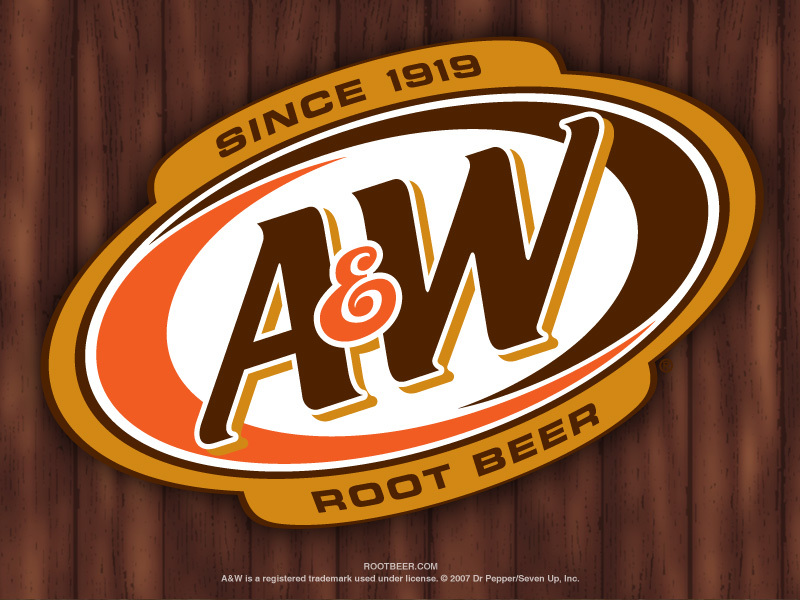 And yes, A&W Root Beer is gluten-free. Hi, Jax. I'm so glad you wrote to ask this question, more for my sake than yours. 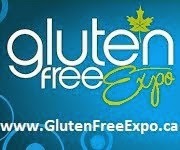 My son learned that he's got celiac disease just this summer and is in Kingston. 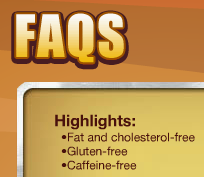 [...] And to answer your question, yes our root beer is gluten-free. Please enjoy it to your heart's content. Thanks so much for writing! Barq's Root Beer - GLUTEN-FREE! The answer to this question can be found on the Coca-Cola website. Barq's is made by Coca-Cola and is clearly on their gluten-free list of products for both the US and Canada. Blue Sky Root Beer - GLUTEN-FREE! After a couple emails and eventually posting on their Facebook page, Blue Sky finally responded about the product's gluten-free status. 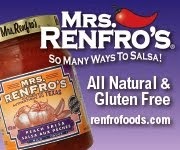 Yes our Root Beer products are gluten-free! Enjoy! Hmm... what's with companies who don't respond to consumer inquiries? I left a message by phone... still waiting for a response. Bulldog Root Beer - GLUTEN-FREE! Yes, Bulldog Root Beer is gluten-free. No wheat, rye, barley or oats. Dad's Root Beer - GLUTEN-FREE! 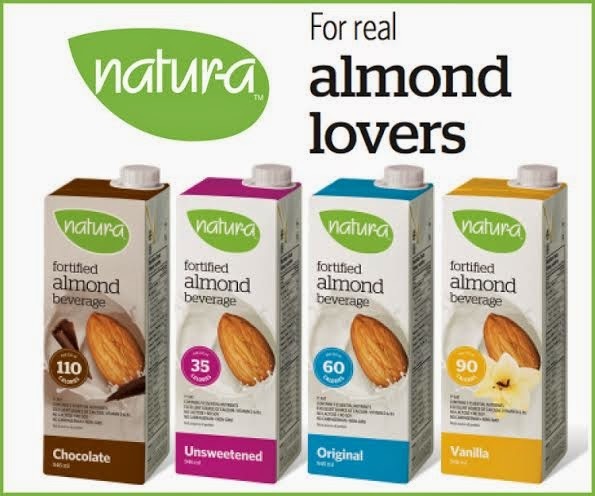 The product is gluten free and does not contain any items derived from wheat, barley, rye or oats. Faygo Root Beer - GLUTEN-FREE! Faygo products are pretty cheap... and they're all gluten-free! No response to email... and the phone rang and rang and rang. Jones Soda Root Beer - GLUTEN-FREE! 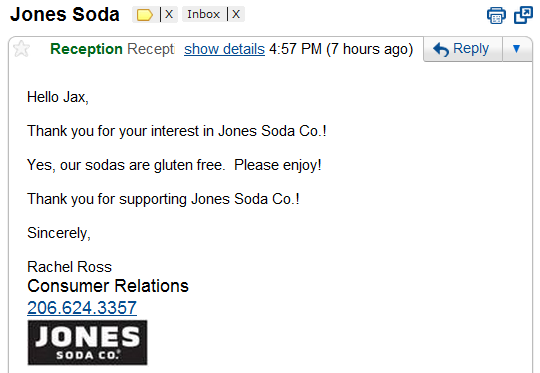 Response from Jones Soda is that all of the sodas are gluten-free! Thank you for your interest in Jones Soda Co.! Yes, our sodas are gluten free. Please enjoy! Thank you for supporting Jones Soda Co.! Mug Root Beer - GLUTEN-FREE! It is indicated right on their website that Mug Root Beer is gluten-free. I received an excellent response from Santa Cruz, indicating that their root beet is in fact gluten-free! 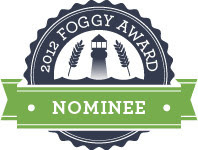 Thank you for your inquiry regarding the presence of gluten in one of our Santa Cruz Organic® products. For over 110 years, providing our customers and consumers with the highest quality products has been of paramount importance to The J.M. Smucker Company. Quality products begin with quality ingredients and we employ comprehensive procurement procedures to ensure our products contain only the finest ingredients from reputable suppliers. The product for which you have requested information, Santa Cruz Organic® Root Beer Sparkling Beverage, is verified "gluten-free". It is important to note that the U.S. Food and Drug Administration (FDA) has not yet defined the term “gluten-free” or established rules for making a “gluten-free” claim on a food product. However, “gluten-free” claims are permitted and each manufacturer is responsible for determining whether or not its products are “gluten-free”. The J.M. Smucker Company has established the following stringent criteria based on the FDA’s proposed rules for making “gluten-free” claims. Ingredient Screening - The ingredient cannot contain gluten sources such as wheat, rye, barley or their derivatives or hybrids. We also review for the presence of oats. Testing - While there is currently not a commercially available test to detect the presence of oats, the product must be tested to verify that it contains less than 20 parts per million of gluten. Manufacturing Procedures - In addition, facilities that manufacture verified “gluten-free” products must have a comprehensive gluten management program. 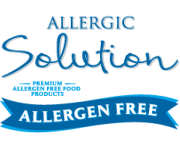 All equipment used in the manufacture of products containing any gluten or oat source must be thoroughly cleaned prior to producing a product that is “gluten-free”. These procedures must be validated and inspected after each clean-up. 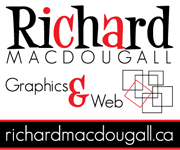 We would like to thank you for your inquiry regarding this product. 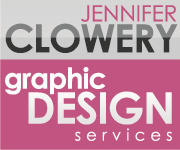 If you have any further questions, please feel free to contact us at 888-569-6994. Stewart's Root Beer - GLUTEN-FREE! 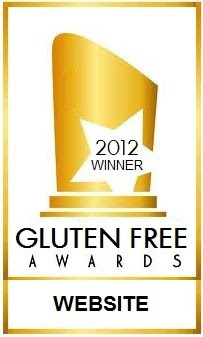 Thank you for contacting us about the presence of gluten in our products. Consumer inquiries such as this are appreciated because they provide valuable feedback about our brands. DPSG products are free of gluten containing materials, with the exception of Mr. & Mrs. T's Bloody Mary Mix, Mr. & Mrs. T's Premium Blend, and Clamato Red-Eye. Virgil's Root Beer - GLUTEN-FREE! 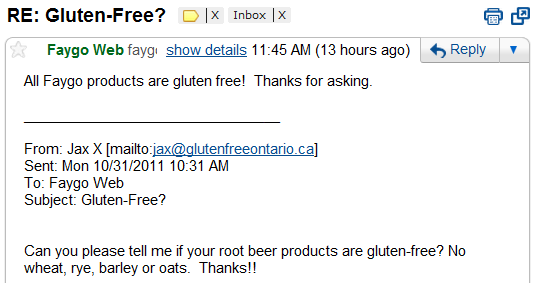 Very "short" answer - yes the root beer products are gluten-free. Zevia Root Beer - GLUTEN-FREE! Zevia is a sugar-free brand that is sweetened with Stevia and it is gluten-free, according to their website. So there ya go. 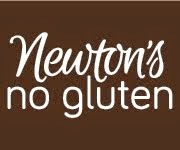 I couldn't actually find a company that still uses ingredients sourced from gluten. Maybe they are hiding from me. I believe the reason this rumour exists is because back in the day, companies used barley malt as the sweetener. The process of making root beer has been simplified and the use of barley seems to have vanished. But feel free to contact any of the companies I have mentioned here to see for yourself that root beer does not necessarily mean "contains gluten." If you have suggestions for other root beer brands I should include on this list, leave me a comment and I will see what I can do. Drink up!! Root beer float anyone? There is almost always a Mug or A&W root beer in my fridge. I have a weakness for a float, too! I think the rumour has been in place because a lot of root beers list modified starch as an ingredient. I've avoided them because this can be gluten-sourced. Nice to know that they are good to go! Root beer float, here I come! What about other pops? Like Coca-cola?? 1) hydrolyzed (plant, vegetable, soy,,,anything) protein. 2) caramel color (most dark pops have it). 3) modified (food, corn, anything) starch. companies like the bulk barn sell buckwheat flour in the gluten free section and it contains gluten. 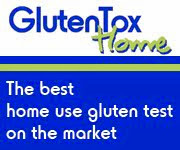 if you do not have celiac disease and are only gluten intolerant it wont bother you but if you are celiac? you can have NO gluten at all. the body deals with it on the protein level and it damages you. do your homework and do not trust these companies to offer you the truth. 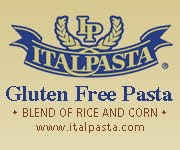 they said it: "the U.S. Food and Drug Administration (FDA) has not yet defined the term “gluten-free” or established rules for making a “gluten-free” claim on a food product. However, “gluten-free” claims are permitted and each manufacturer is responsible for determining whether or not its products are “gluten-free”. I believe buckwheat, despite its name, is gluten free. I have a specific allergy to wheat...I've read elsewhere that many of these products you've listed are gluten free according to the 20ppm which makes me wonder what is the 20ppm. 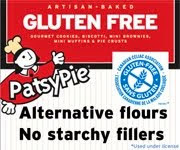 I think that is important to state rather than just saying it's gluten free as some people are sensitive to the 20ppm. I know its a little different, but any amount of wheat derivative negatively affects me.